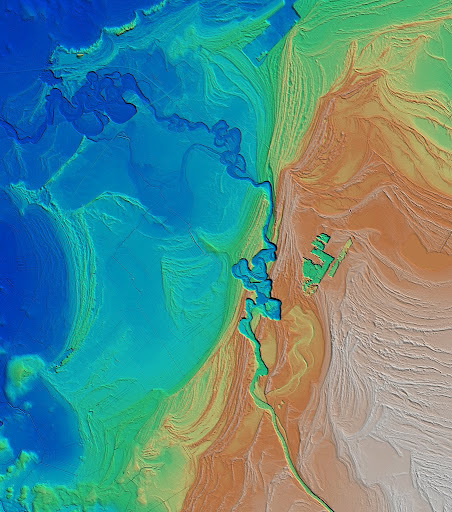 ‘Forced regression’ is an important concept in sequence stratigraphy – it occurs when relative sea level falls and the shoreline shifts in a seaward direction, regardless of how much sediment is delivered to the sea. This is in contrast with ‘normal’ regressions, which take place when relative sea level doesn’t change or it is rising, but rivers bring lots of sediment to the coast and are able to push the shoreline seaward. These concepts are commonly illustrated with simple cartoons (like the ones on the SEPM sequence stratigraphy website), showing how beach deposits stack in a dip direction, and how their tops are eroded by rivers as sea level continues to fall. Unless you live in a horizontally challenged flatland (vertical-land? 2D seismic-land? ), real regressions happen in three dimensions, and their morphology is much more complicated, more interesting, and more beautiful than what one can dream up with a few lines in a single cross section. 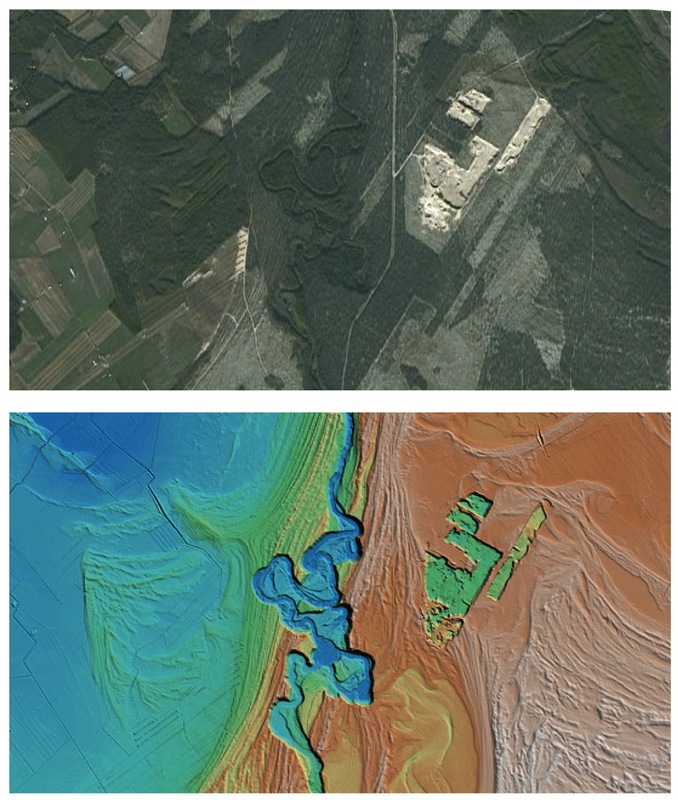 The example below is an airborne lidar image from Finland. The original data has a horizontal resolution of 2 meters and a vertical resolution of 30 centimeters. The two dominant morphologies and deposit types clearly visible in the image are (1) ancient coastlines, formed as sand brought to the sea by rivers was reworked by waves into beach ridges; and (2) an incised river valley that cuts through these shoreline deposits. Note how the river seems to be incising and migrating laterally at the same time, generating a scalloped valley edge. The reason for this forced regression during a time of global sea-level rise is the isostatic rebound of the Scandinavian Peninsula after the retreat of the ice sheet. Looking at this crystal-clear morphology, it is tempting to think that this area must look very interesting in Google Earth as well. It turns out that it doesn’t; this is actually a pretty heavily vegetated land, not too spectacular on conventional satellite imagery (see figure below). The laser rays of the lidar are able to see through the non-geomorphological ‘noise’ and show stunning geomorphological detail. To explore a higher resolution version of this image, and for additional lidar visualizations of similar beauty, check out Jouko Vanne’s Flickr site. The National Land Survey of Finland has started collecting this kind of data in 2008 and they are planning to cover the whole country with high-resolution DEMs within a few years. A great way to spend taxpayer money, as far as I am concerned. This is simply awesome and makes me want to become a geologist. Thanks, you rock! Thanks Gabe! And thanks to the actual creators of the image, Jouko Vanne and the National Land Survey of Finland. This is really fantastic. I'm sure I will use it in the near future in my Stratigraphy class.